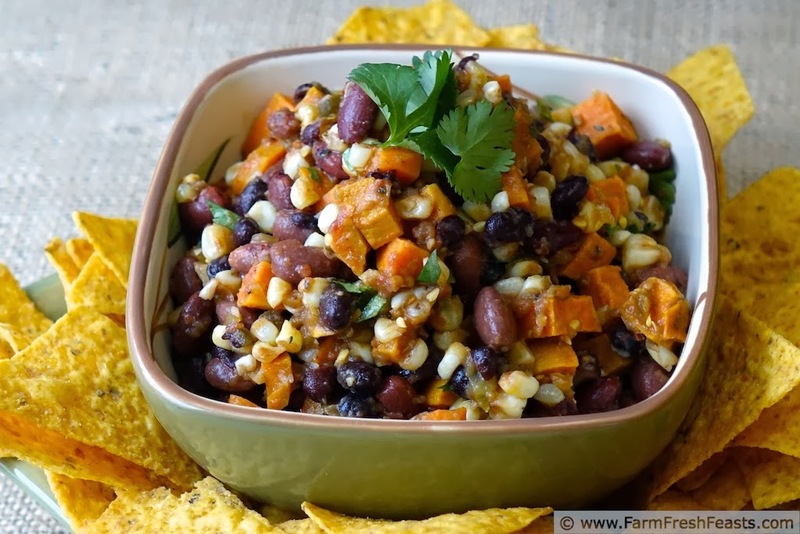 Roasted sweet potatoes and corn tossed with beans and avocado in an red and green salsa dressing. One of the ways I put up food to eat local all year long. When the garden is barren and there's snow falling down is a strange time to talk about harvest and abundant vegetables, no? I think it's exactly the right time. 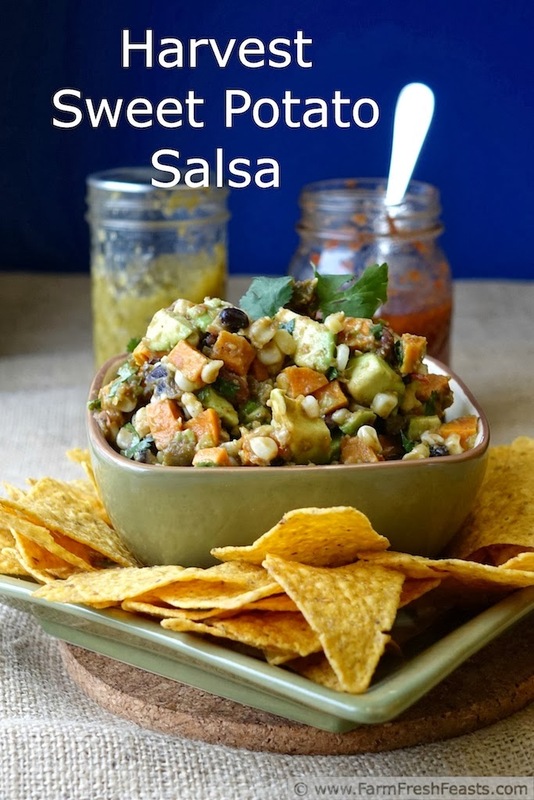 You see, the vegetables I used in this salsa--the corn, sweet potatoes, tomatoes and tomatillos that is*--came from my Community Supported Agriculture (CSA) farm share. George, Mark, Josh and Erik of Patchwork Gardens grew and harvested them, and we got a weekly box of locally-grown vegetables during the growing season. Once in my kitchen, I performed Vegetable Triage--eating what won't keep, freezing or canning what can be put up, and using a cold corner of my breakfast nook as my Strategic Winter Squash Reserve (link to a photo on my FB page) for the long storage crops. Even though the fields are brown, we're still eating the fruits of our farmers' labors. If you'd like to know more about where your food is grown, now is the time to research local eating in your area. Up on the left sidebar is a Local Harvest gadget. If you're in the US, type in your zip code and see what's available near you. 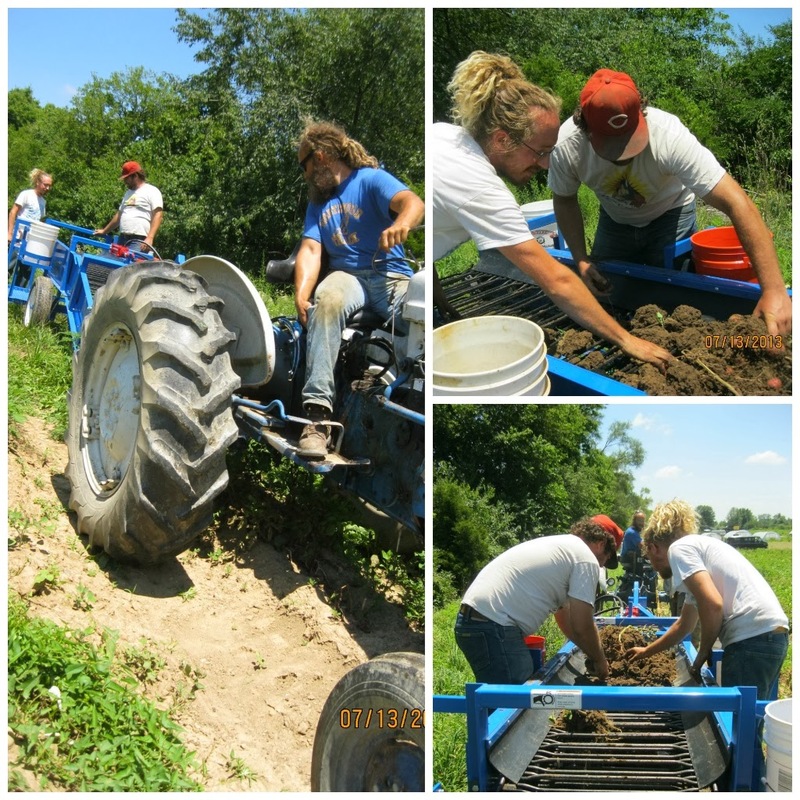 Signing up with a CSA farm share before the season starts means your farmers will have the funds to purchase or repair equipment like the potato harvester shown here, which harvested the sweet potatoes I used in this salsa. *See the avocados in the second photo? Yeah, they sure are not local to Ohio and one of the reasons (along with bananas and salmon, vanilla and chocolate, tea and olive oil) that I will never be a completely local eater. To me, local food just tastes better (think garden tomato vs store-bought) so I put my efforts into eating local food where I can. I am fortunate to have a choice where I spend my dollars on food, and I choose to keep my money in my local community when possible. It's why I started this blog and organized my Visual Recipe Index by produce type--to help other folks eat locally as well. Tuna Bruschetta by What's Cooking, Love? In a large bowl toss sweet potato cubes with oil, a generous pinch of salt and a few grinds of pepper. 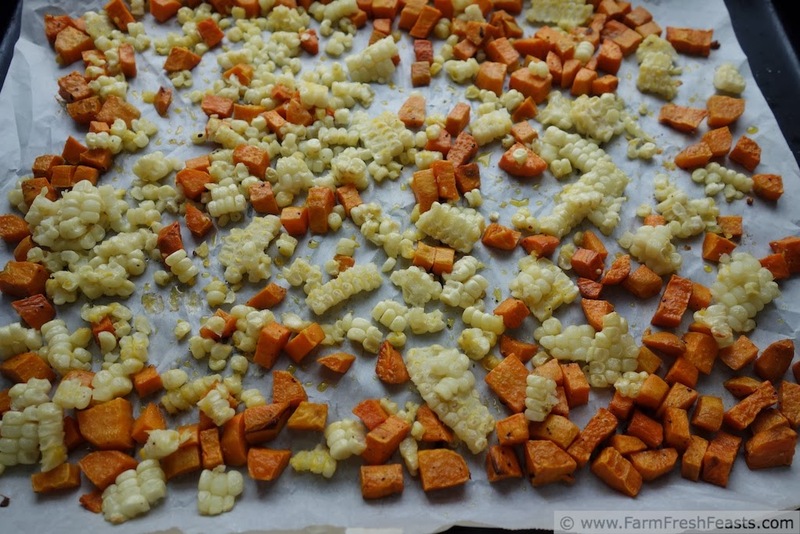 Spread on a rimmed baking sheet (I use a piece of parchment for easy clean up) and roast for 10 minutes. While the sweet potatoes are roasting, toss the corn in the bowl to coat it with any remaining oil and spices. In a large bowl, toss roasted vegetables with beans, salsas, and cilantro. Taste and see if you'd prefer more salt or pepper, or a more moist salsa--then add more salsa or salsa verde. Just before serving, fold in avocado cubes. This is also good eaten with a fork straight out of the fridge by a hungry spouse. This recipe is shared with the Tasty Tuesdays, What's Cookin' Wednesdays, Fresh Foods Wednesday, Food on Friday and the From The Farm Blog Hop. My favorite appetizer is 7 layer dip. However, over the years it has become more like three layers of goodness. And with leaving off of the lettuce and meat, it becomes a veggie option (I use veggie beans) and easily storable without worry of wiltly lettuce. That's a brilliant idea. I hate wilted lettuce. 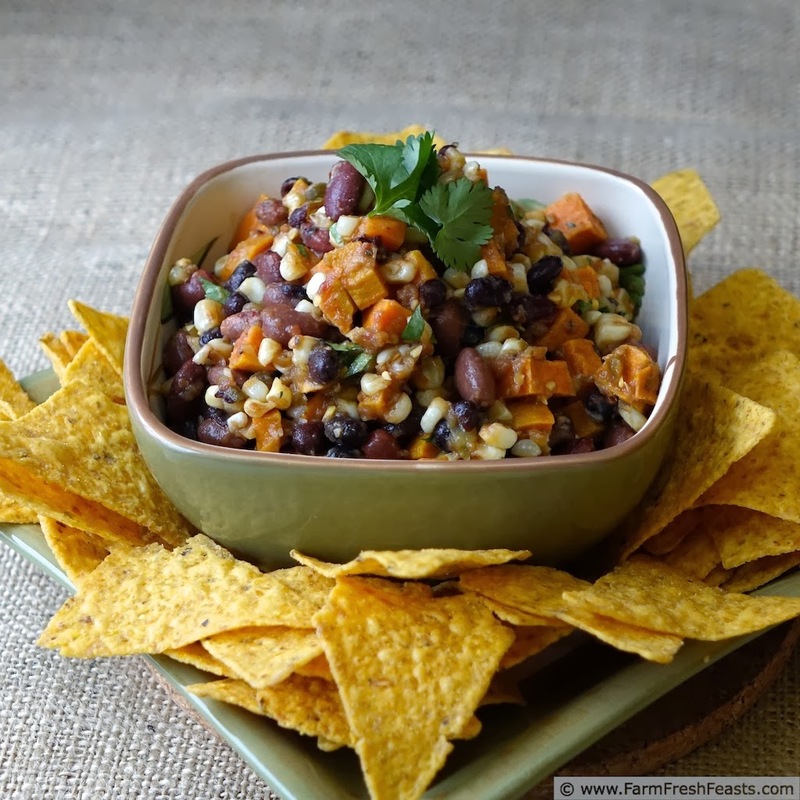 Beans, sweet potato and avocados... that one healthy and tasty salsa ! I hate to call something healthy since it's such a subjective term--but you're so right it's tasty. Yum, spinach artichoke dip. Excellent choice! salsa with sweet potatoes--how fun! i love chips & guac on game day. I think our game day snacking will start with lunch, as the game isn't until evening. I'm a fan of avocados, and have been working hard lately to increase the amount of avocado in my life. Well, I know first hand how delicious this combination is, because I've built a whole business on it! My company's called Yummy Yammy, and I'm in Vermont, where I concocted these recipes... 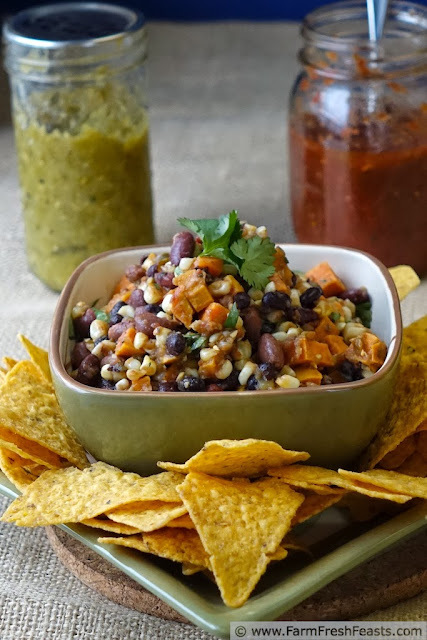 I make sweet potato salsas in jars, and they are natural and made from really great ingredients, though not as farm-fresh as your scrumptious salsa here! I'm in a coup;e of stores in Ohio, and on Amazon, for when you can't make your own. Nice job on the recipe!! I appreciate your kind comments. I have my chips ready! This is my kind of food, I love sweet potatoes in just about everything! I admit I dug in with a fork because it was just that good. I love the first picture. It's beautiful, and this dip is another winner. I'm totally digging vegetarian appetizer week. Can you do this ever week please. To hell with sanity; it's totally overrated. As it turns out, Foodgawker likes a version of that photo too. Thanks! I can't do appetizer week every week--it's taken me 2 weeks to get to commenting on this post! My favorite appetizer is guacamole. I could just eat it by the spoonful! 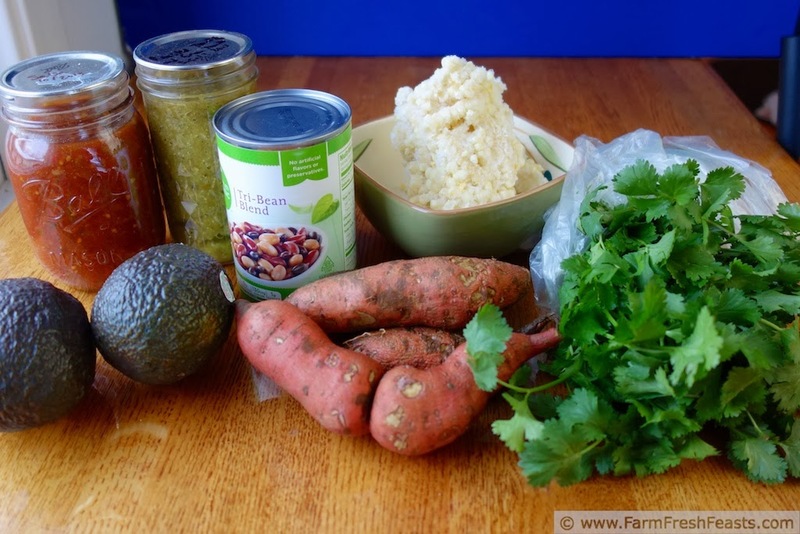 I have got to try this because seriously, sweet potatoes and avocado?! Amazing! I'm a big fan of guacamole as well. Thanks for stopping by! I just love how you're facilitating more local food stuff on your blog - like the app at the top you just talked about. You're doing good work, Kirsten. And I want my own sweet potato harvester!!! Not that I have that many sweet potatoes..... but I might consider it if I had one. hahahaha... Recipe looks stunning! My back yard is far too small for a potato harvester, but if I could harness the energy of Wee Oliver Picklepants when he's chasing a squirrel, it would get through my raised beds easily. I have had a lot of different kinds of salsa but never a sweet potato salsa. I guess I just found my mew recipe to try for today. Thank you for sharing with the Clever Chicks Blog Hop! I hope you’ll join us again next week! Foodgawker found a new sweet potato salsa--Woot! I just adore this salsa. What a novel idea to use sweet potatoes. I cannot wait to try it. Novel to you, 'please help me get rid of the overwhelming pile before they go bad' to me! This salsa looks amazing! Love the use of sweet potatoes. I'm pretty pleased with how these photos turned out--helps me to spread the CSA message if there's a pretty photo attached!